Samsung after making the note 2 at 5.5 inches has yet again increased the size of Note 3 to a huge 5.7 inches which is now turning the Phone into a Phablet. The size is mentioned at 5.7 to not give the psychological feeling of 6 inches, but i must say Note 3 is very huge and i don’t think it will fit into any Jean pockets easily. Note III is supposedly the first device to get a plastic AMOLED display and an Octacore Processor with 3 GB ram which will surely make it fast compared to its size. With Samsung increasing the size of its smartphones gradually it is diminishing the difference in sizes between Phones and Tablet devices. The Pricing and other details will be updated as soon as Samsung Galaxy Note 3 is officially released in September all over the world but in Japan and USA it will be released in October. Samsung Galaxy Gear was also released along with Note 3. With the iPhone 5s or 6 release due, 2013 is going to be a clash of the titans yet again with Samsung and Apple fighting it out in the smartphone market. The Flexible display which samsung showcased sometime back is no where to be seen in production anytime soon. 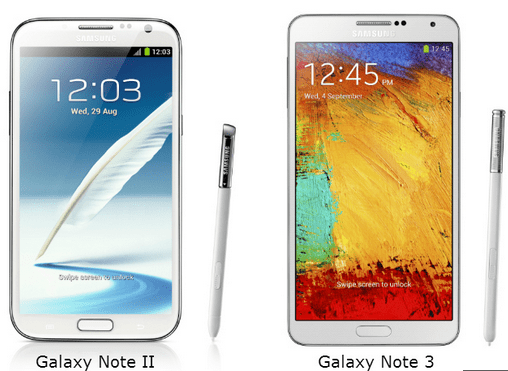 We will be comparing Samsung Galaxy Note 3 vs Galaxy S4 very soon keep watching this space for more.